Communicators in the CSR and sustainability space often need to be opportunistic as they search for ways to build their programs. Using the United Nations General Assembly as an example, Judith Rowland of FleishmanHillard provides tips communicators can use to leverage opportunities at large meetings of public and private leaders. Despite the demand for transparency, traditional thinking still holds that when brands receive bad news they should do their best to keep it quiet. When a brand disrupts this pattern and amplifies its bad news, it becomes newsworthy. This describes the case of a gunmaker that issued a press release when its bank refused to continue doing business with it. Goldman Sachs offered a blanket denial to the reporting from a story published earlier this week in the New York Times, which accuses Goldman of dismissing claims from a top executive who used the firm’s own whistleblower hotline to call out a litany of ethical violations he saw from the inside. Goldman’s statements on the matter call to question why transparency and accountability remain so difficult for the bank to put into practice, and its statements similarly raise more questions. LG Mobile has partnered with actress Aubrey Plaza to bring $200K worth of LG G7 ThinQ smart phones and service to aid recovery efforts in Puerto Rico, which is still recuperating from the aftermath of the 2017 hurricane season. Plaza announced the initiative on Twitter, and LG sent her to Puerto Rico to hand-deliver phones with the non-profit The Hispanic Federation. 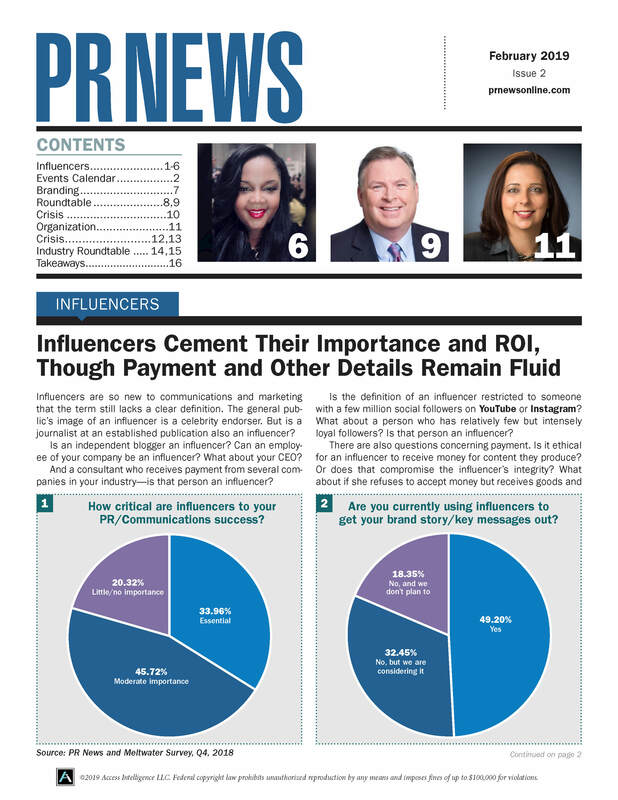 In each edition of PR News we highlight takeaways from select articles as well as additions to the PR News Resources Center, available to subscribers only. This edition highlights a new report from Yum! Brands and a short but terrific template for editorial submissions. More than a hollow and cookie-cutter corporate document, “Toward a Vision for Racial Equity & Inclusion at Starbucks: Review and Recommendations” reads as a realigning of perspectives and priorities. This is the work of a brand that has taken a hard, honest look at itself and is ready to share what it has learned. Conventional wisdom held that brands should avoid weighing in on politics or social issues. But as research reports and surveys show, consumers now want brands to stand for something beyond goods and services. That said, brands wade into the political world on several levels, although they do so at their peril, and sometimes their motivation is unclear. As we know, brands must stand for something beyond the products and services they offer. This means they can no longer remain silent in the face of an attack. They also need to admit when they make mistakes. Margaret Hoerster, a senior partner at Finn Partners, and Ameet Sachdev, a VP at the firm, argue timing, messaging and relevance play important roles when brands decide they should address an issue publicly.